It is a matter of weeks before we say goodbye to the old site and introduce the new one. Just few details left... One of the biggest challenges has been the "Tools" section. As mentioned earlier this year on another post, one of Palaeolexicon's many roles is to provide you with tools that will help your research. One of the most painstaking things in historical linguistics, is the identification of cognates across languages. You know how it is... Open every single dictionary, lookup for words that sound/look relatively similar, have a relatively close semantic context and satisfy all kind of phonological rules. Now look at this screenshot below. This is the "Cognate research tool". It will use various algorithms to identify possible cognates across many languages. It will save you lots of time, since it will do most of the job (including a semantic analysis). Once those cognate candidates are presented, it is up to you to evaluate the results. If something looks interesting enough, you can request further analysis on that candidate to find more distant relationships. However, you should be cautious. Those algorithms have not been thoroughly tested and cannot guarantee safe results. The last decision is always yours. By time the algorithms will be improving and the data available for analysis will increase. There is this idea of creating plugins that will test the results against the phonogical rules that apply for every language. That should increase the accuracy significantly, however this feature belongs to a future project. In less than 60 days, this year is over and a promise has to be fulfilled. 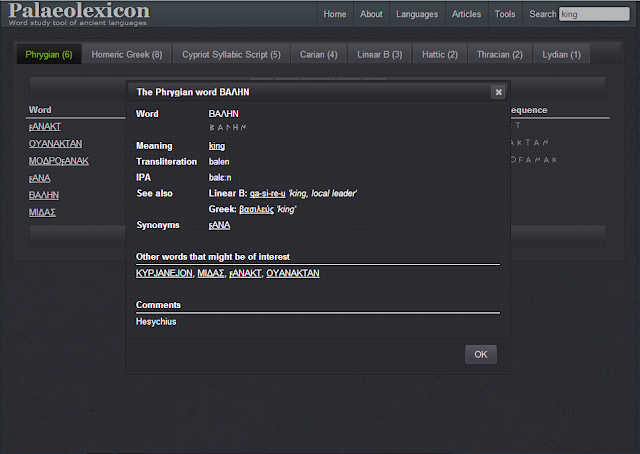 Palaeolexicon version 2.0 will be released and it is time for some teasers. We won't reveal all points, but 5 will be hopefully enough. The introduction of IPA (international phonetic alphabet) that will help users to read words correctly. Where possible of course, since not even the pronunciation of Ancient Greek is certain. The introduction of synonyms: Palaeolexicon is aware of the word meanings and can therefore list words that are considered synonyms. Words of interest: Words of similar meaning, of the same context or group are listed as "Words that might be of interest". That means that if you're looking for the word "king" in a language, you might be interested of the words for commander, lord, leader etc. Full rendering of symbols: Forget those special fonts you need to read Lydian, Carian etc. You won't need them anymore! 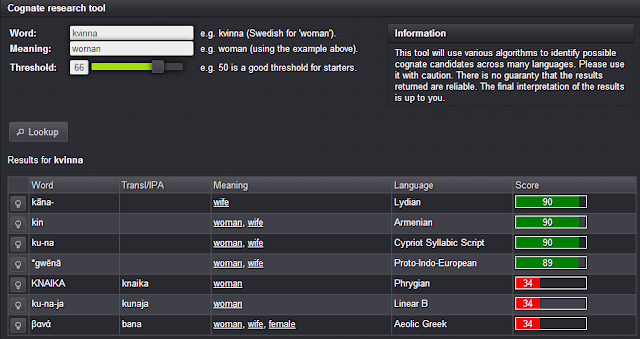 Symbols, hieroglyphics and cuneiform will be visible in your screen together with their IPA readings. Partial dictionaries: There are many dictionaries that are being prepared in the background but are not visible (Proto-Indo-European, Lycian, Hittite, Sanskrit, Armenian, Ancient Macedonian, Hurrian, Sumerian etc). So far you can only see their traces in words that appear as "related" or "see also". In version 2, many of them will be available for searching, but not browsing. This goes out to all you people who are into historical linguistics and not only. Ask yourself "what takes most time when studying words"? Many of you try to find similarities across languages and each time you find an interesting word, you start searching in your dictionaries how that word is/was in language X. Currently, and to some extend, Palaeolexicon helps you with that. It is not enough though... In version 2, we will introduce some powerful tools for your research. So, here is the concept. You find this word in language X and you want to know if that word exists in a similar form in another language. Palaeolexicon has currently 8 dictionaries, 6 distinct languages and many non public dictionaries that still need some work until they reach out to you e.g. Latin, Sanskrit, Hittite, Hurrian etc. Right now, you need to manually search for words in those dictionaries and make your own comparisons. If you're lucky, we have already linked them together so that you can see the similarity across languages. In most cases that doesn't happen though. So, what about a tool where you type your word of interest, its meaning and then click on a magic button that does the work for you? You put for example the Latin word "nomen" and its English meaning which is "name". Palaelexicon's algorithm will then try to match your input with all available (public and non public) words in its database and suggest you the following: όνομα (Greek), ονομαν (Phrygian), nama (Sanskrit), namo (Saxon) and so on... Well, that is a bit too easy isn't it? What if the etymology of the word you search for is not exactly the same in some languages? Assume you search for old persian martiya which means man - Palaeolexicon will suggest you words like Venetic mortuvu 'dead', Greek μέροψ 'mortal', Armenian meranim 'to die', English murder and so on. Except from sounding similar, these words share similar meanings but not exactly the same. They have a semantic similarity regarding life and death. Their semantic similarity might then divided by distance, for example a cup is a hollow object or bend, but it is also a utensil. Sounds like you're about to save many hours of research right? Of course, keep in mind that computers are not humans and the last decision is up to you. If you have any more suggestion on what would save your precious time while researching, please don't hesitate to contact us. There are three* Phrygian words related to water and one of them is ΒΕΔΥ. The account for this word, comes from Clement of Alexandria who lived in the 2nd century AD and got exposed to the neo-Phrygian language. Immediately one would read the word as bedu which doesn't sound convicing at all to my ears. It doesn't take much time to understand that what Clemens heard from the Phrygians was wedy or vedy and not what reads in the latin alphabet as bedu. Remember that the Greek Β (beta) was not always equal to the Latin /b/. After some point, /b/ became a /v/, while /w/ (Ϝ - digamma), when not dropped, turned either to /v/ or U+vowel. The later is attested in both Phrygian and Greek, however we have no clear evidence that Phrygian /b/ turned to a /v/. In any case, we should seriously consider reading ΒΕΔΥ with a medieval Greek β, rather an archaic one. Besides, ΒΕΔΥ should have the same root as all other Indo-European words for water, that is to say *wed-o-/*wódr̥. There is not a single Indo-European language where the word for water starts with a B. Meanwhile, J. Pokornys Illyrian gw-> b- phonetic mutation theory, seems very unlikely. Some Indo-European examples on water listed below. * The other two words for water are ydor and akala, the later being the only one directly attested on inscriptions. What is a barbarian? An etymological analysis. "Barbarian" or "βάρβαρος"; one of the most ambiguous terms in ancient history. Still today, many authors pressupose its meaning, which leads to great missunderstandings. It is about time we take a close look on what it actually meant in ancient Greece. Our main source will be Hesychius of Alexandria, the Greek lexicographer whose work has been of great importance in the field of historical linguistics. βάρβαροι· οἱ ἀπαίδευτοι, barbarians, the uneducated he says. Apparently, this is the reason why we today may use the term to denote "uncivilized behaviours". βαρβαρισμός· παράτονος διάλεκτος, barbarism, a bad sounding dialect he adds. Here the term is brought into relation to speech, being a product of the Proto-Indo-European word *barbar "unintelligible speech". However, it is obvious by its definition that this speech is not necessarely a different language, hence διάλεκτος (dialect) is used. βάρβαρα· ἀσύνετα. ἄτακτα, barbarously, inexpedient, naughty. Again, the term falls into the category of behaviours, being reminiscent of its modern usage. βαρβαρόφωνοι· οἱ Ἠλεῖοι καὶ οἱ Κᾶρες, ὡς τραχύφωνοι καὶ ἀσαφῆ τὴν φωνὴν ἔχοντες, barbarophones, the Eleians and the Carians, for having a harsch and uncertain speech. This is the essence ambiguity, since he makes it clear that the term might be used for Greeks (in this case the Eleians), as well as non-Greeks (the Carians). The Eleians were speaking a dialect of Greek, that was probably very difficult to understand by other Greeks. The Carians, were in several occasions mentioned as speaking a very strange, non-Greek language.